I wish that SCF could have repped the real #TCAMP2010 in DC this weekend but as you can see we were conducting our own camp SeeClickFix style. Thanks to Yale's Freshmen Day of service hundreds more public officials are being signed up for watch areas around the country. The State of California wanted to publish all the cities receiving alerts from SCF so we're helping to add to that list. Hello Transparency! Hello Open Gov! Hello Sunlight and O'Reilly! We recently introduced ourselves to the folks at GovLoop.com, a new social networking site for government officials, with the following blog post. Look for it on GovLoop's blog. Government of the people, meet the people. With technology making our world smaller and more closely interconnected than ever before, it seems only natural that new social media like SeeClickFix.com could link citizens and government in productive dialogue about issues affecting the public space. 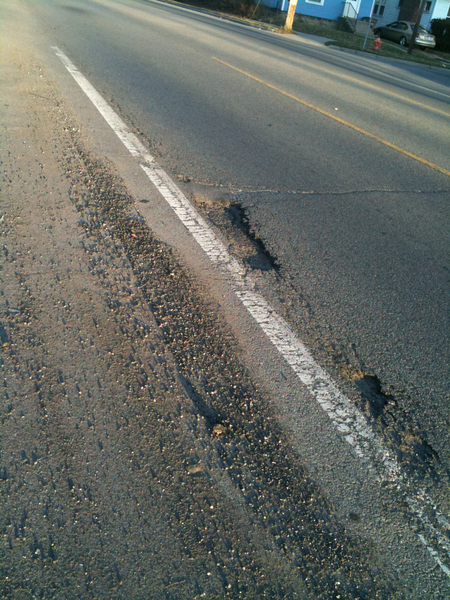 Recently we helped bicyclists in Lansing, Michigan help clean up debris-coated bike lanes. Spring time brings messy streets just as much as it brings flowers: John from the League of Michigan Bicyclists noticed that all sorts of gravel and debris has collected in the bike lane on Kalamazoo St. in Lansing, MI since the snow melted. You can tell how bad it is in the photo he posted. After he filed a report on SeeClickFix, a city official responded within eight hours. Not only did she inform John that the street would be given priority when street sweeping began, she explained how the city's system works, complete with a phone number for checking up on a street's status. John was grateful and suggeted that the city sweep all the streets with bike lanes first. Prioritizing bike lanes would be an easy way for the city to act in accordance with its new Complete Streets ordinance, John wrote on the issue's SCF page. Erica from the City of Lansing, said that she'd be happy to forward the suggestion on to the Superintendent of Public Service. By creating this space for discussion, we hope to build up the development and implementation of good ideas in the public space. Local problems will find straightforward fixes from those who know the area best. Moreover, the provision of public services is too often a thankless job. By making the process a little more transparent and a little more accessible, citizens get a better idea of how much work public servants are doing on their behalf - and ultimately, they are muchmore grateful for it. This week has been full of media mentions for SeeClickFix by big name publications; yesterday there were three. The Washington Post picked up a story from Gazette.net (a Maryland news site) about how important SeeClickFix was during Maryland's massive snowstorms this winter. The article reports that Natalie Cantor, director of the Mid-County Regional Services Center for Montgomery County, MD, regularly uses the site to browse for issues and direct them to the appropriate department. 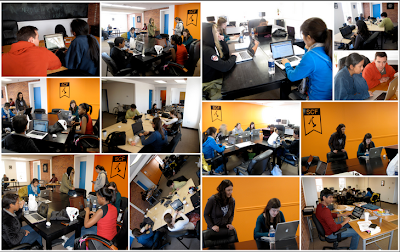 "Anybody anywhere can look at SeeClickFix, and people's comments become available to the entire world... It keeps everybody on their toes and in contact with each other," she said. 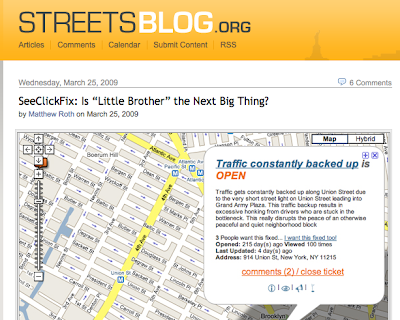 In New York, The StreetsBlog wrote about how SCF is used in Philly, New haven, Boston, NYC and San Fran. "We know that it can be much bigger than 311 in New York," Ben told the blogger. And on the Huff Post, in a post titled "Government Must Give a ****" (that first * stands for an 'f') tech blogger Christina Gagnier railed against government insensitivity to citizen demands. She said that if governments try to become high-tech and interactive without showing their citizens that they care, the new products won't accomplish much. 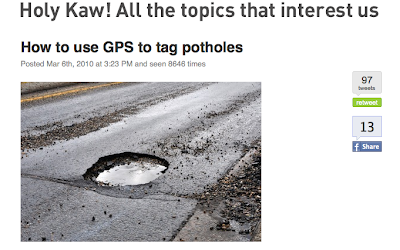 On the other hand, "Civic iPhone applications like SeeClickFix work because their users feel like the city government actually cares when that pothole finally gets filled," Gagnier wrote. And Gagnier's advice for this year's mid-term election season? "Candidates, you want a winning November election strategy? Act like you give a ****." The Wall Street Journal put out an article today about our good friends at Manor, Texas, a SeeClickFix Plus using suburb of 6,500 people near Austin. The city has become the poster child for low-budget, high-tech, high-creativity governance thanks to its early embrace of services like SCF as well as its unprecedented use of a game-based software, called Manor Labs, to incentivize citizen brainstorming of good ideas. "People who sign up for Manor Labs submit ideas that are voted and commented on by other users. Participants get points for contributing ideas, voting, having ideas implemented and so forth — and the points can be used in Manor’s online store to get prizes such as T-shirts, a framed flag and the opportunity to be mayor for a day. Since the site launched in October, Manor has gotten 68 ideas and implemented five of them, including posting recycling and trash schedules online and allowing automatic debits for utility bills. Manor also uses SeeClickFix to help residents report street and water problems in their neighborhood. Through the program, people can open tickets online and send photos to illustrate the problem." Manor's Assistant City Manager Dustin Haisler shared the stage with Ben last week at a SXSW panel called the City is a Platform. Both Manor Labs and SeeClickFix understand the importance of government transparency and demonstrated interaction with its citizens. In the words of Haisler “You can trust citizens … to drive an idea to solution." "Never doubt the average person"
Check out a nice write up of an interview with Ben about SeeClickFix on Conntact.com, Connecticut's Business News Journal, that came out recently. There's a big difference between being a resident and being a citizen of a community, according to entrepreneur Ben Berkowitz. Citizens relate to local affairs, react to local events and respond to local problems, Berkowitz insists. 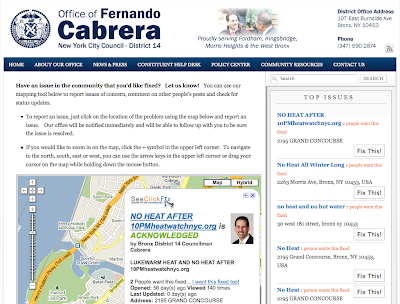 The site is easy to use, and it demonstrates that any citizen can help resolve a neighborhood concern, he notes. The basis of SeeClickFix is the strength of that citizen power, Berkowitz says, adding, "Never doubt the average person." Holy Cow! I was interviewed in Dubai. Want to have a SeeClickFix user account but don't want to use facebook? With the SeeClickFix free user account you can track all of your issues and earn civic points for fixing up your community. Compete with your neighbors and your elected officials for civic glory. Another SeeClickFix issue generated some block-level news. This time community improvement takes us to the Mission in SF where residents are concerned about disorderly patrons of the local park. 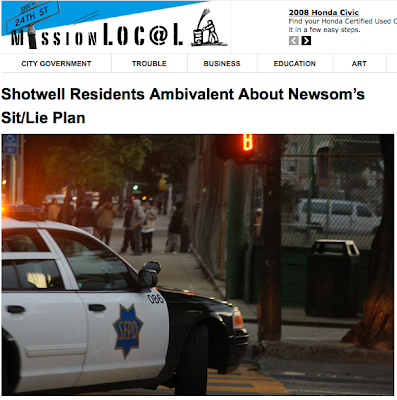 The issue reflects a larger conversation around Mayor Newsom's Sit/Lie Plan which seeks to keep people from lying or sitting on public parks. 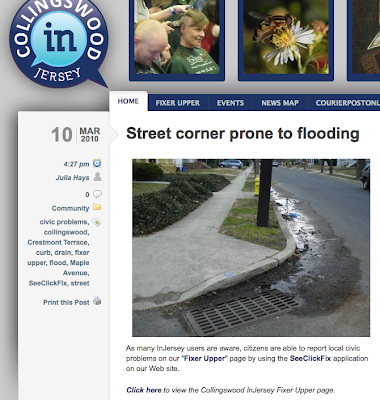 And on the East Coast it was litter and flooding that was making the local news via SeeClickFix thanks to Hyper-Local InJersey.com. Worcester, Mass's Public Works has been speedy about responding to SeeClickFix posts from its residents. We thought that they just really liked SeeClickFix–according to Wednesday's article in Worcester Magazine, it turns out that they didn't even know they were using it at first. While Worcester has publicly been trying to make its government more high-tech, the article reports that use of one particularly effective technology has "gone under the radar": SeeClickFix. That technology "is integrated so well into Worcester that no one really seemed to know what it was or how it got here." SCF user Kevin Ksen said that when he reported an abandoned mattress on the roadside, he got an e-mail from public works three hours later. After talking to the public works administrator who sent him the email, he discovered that “[The DPW employee] had no idea she was a part of SeeClickFix, that’s how seamless it is." We had no idea how smooth we are. Now SCF is a staple for Ksen and his community group Pleasant Street Network Center, who finds it to be a more efficient way to keep track of issues in their neighborhood. New Haven's Chief Administrative Officer Rob Smuts (left) announced New Haven's strengthened partnership with SeeClickFix through their subscription to SeeClickFix Connect. SeeClickFix Co-Founder Jeff Blasius (center) and Howard Weissberg (right), deputy director of the Department of Public Works, stood by. the first city to facilitate the circulation of its CRM data among community organizations and other non-governmental entites responsible for the public space, through use of SCF's "watch area" system. The city has been very supportive of SeeClickFix since its founding, and we look forward to working together under the new terms of this groundbreaking partnership. New Haven's SCF issues have a 70%-fixed-rate. Let's keep the city and ourselves on our toes as we continue to speak up for what we want New Haven to be. Venture capitalist, author, and entrepreneurship guru Guy Kawasaki was one of many who tuned in to Friday's All Thing's Considered story on SeeClickFix. Afterward, he posted about us on his ideas blog, Holy Kaw. Kawasaki is the author of 9 books about technology and entrepreneurship–including Reality Check, The Art of the Start, and Rules for Revolutionaries–the founder of Garage Technology Ventures (a venture capital firm for startups), and a former fellow at Apple. Tune in to NPR today at 5:40 PM to hear Ben tell the country about how awesome SeeClickFix is! He'll be on the All Things Considered segment; check it out on WKPT 90.5 FM. More to come as the event gets closer. Click here to read more about the "unconference." 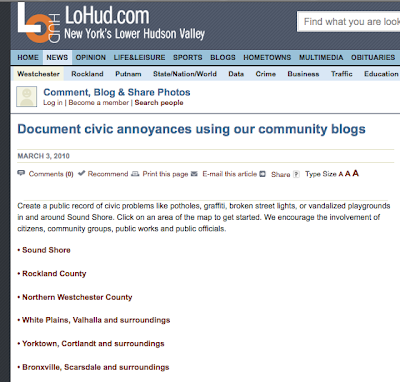 Our last post mentioned new SCF community in Albany, but SCF'ers in the Lower Hudson Valley have also come alive today with LoHud.com's story about pot holes and the addition of SEVEN map widgets to their area blogs. Like pretty much everywhere else on the Eastern Seaboard, the LoHud area is gearing up for a particularly miserable pot hole season. SCF has been popular in New York City for a while, but we just recently made inroads in the Albany area. 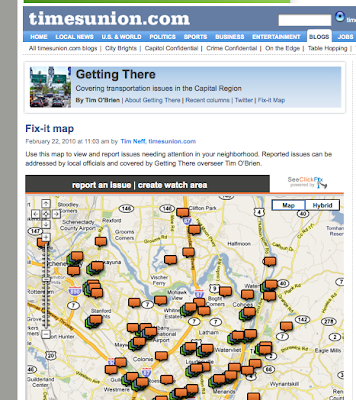 Thanks to the Times Union's new map widget on their transportation blog, our capital area maps have been blowing up with new issues. No, it's not the dilapidated hovel in the center of the photo. It's the neat three-story rowhouse just next door. Living next to this mess has caused already caused them problems - about $9000 worth of them. The drywall in their basement had to be torn away after getting soaked through. The wood in their home's main staircase is rotting from the water seeping through the common wall. Even the brick downstairs is starting to show signs of water damage. Their problems started about two years ago when the company building the house were denied permits - after they had already started construction. 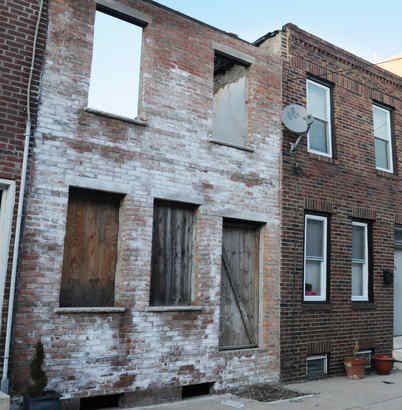 They abandoned the project, leaving a vacant facade with no doors, windows, or roof. Antoinette and Tyler tried getting in touch with the city to no avail; they filed 11 complaints starting on Nov. 29, 2008. Philadelphia's Licenses & Inspection Dept. came to the site twice but took no action. They reported the problem to 311, only to get redirected back to L&I. That's when they turned to SeeClickFix.com. "At least with them you can see what is happening with your complaint," Antoinette told a reporter from Philly.com. You can view the ticket here. We've always thought that sunlight was the best disinfectant; let's hope it can do something for Antoniette and Tyler before things start growing in the murky subterranean puddles next to their home. BAINBRIDGE ISLAND, March 1, 2010 – The City of Bainbridge Island today began a “test drive” for a new tool to give citizens quick access to reporting non-emergency problems to the city using their GPS smart phones or the internet. Bainbridge is one of six cities in the United States to date to offer its residents the use of “SeeClickFix”, a new free software “app” that allows people to quickly report problems from an iPhone, Blackberry or Android phone. The SeeClickFix system can also be accessed by direct dial, through email and online. The phone apps use built-in GPS locators to enable citizens to report problems on the spot, sending an instant report with GPS coordinates and optional photo attachments to a Google Map-based tracking system. Verbal and internet-based reports are routed into the same system by SeeClickFix. Once the SeeClickFix system receives a report, it generates a message to City staff and posts the information on the SeeClickFix map. This can be accessed either through the City’s website, www.ci.bainbridge-isl.wa.us or at www.SeeClickFix.com. Automatic responses keep the citizen reporter informed as progress is made and the problem is resolved. Anyone can view the SeeClickFix map to check on the status of a report, regardless of who has filed the report. “This is a great example of City staff taking a creative approach to help us improve our cost effectiveness and transparency,” said Interim City Manager Lee Walton. Walton noted that the idea of evaluating SeeClickFix was initiated by City staff, who brought the tool to the attention of the administration and took on responsibility for investigating the program and facilitating its implementation. SeeClickFix is free to citizens; the SeeClickFix account costs the City $100 a month. The SeeClickFix phone app will initially be used by the City’s Water Resources and Code Enforcement divisions to monitor water pollution and code enforcement incidents. Reports in these areas will be displayed on the City’s website. Other functional areas may be added as the effectiveness of the program is evaluated. To file a report, SeeClickFix can be accessed via the app on a smart phone, online at the City’s website, www.ci.bainbridge-isl.wa.us or www.SeeClickFix.com, or by direct dial at 1-877-853-1552. To download the free SeeClickFix app, visit www.seeclickfix.com/apps or go to your phone’s app store. We just posted a new tutorial of how to register and use a SeeClickFix Pro account. Check out this inside look into the Pro dashboard, with its many nifty features. Urban planning news site Planetizen.com ranked SeeClickFix among the top ten websites of 2010 for those interested in urban planning, design, and development. Praising SCF as "one of the most promising tools to enhance public participation in government," the rankings included other great resources like data.gov, GOOD Magazine and The Transport Politic. Check out Planetizen's past coverage of SCF here and here.